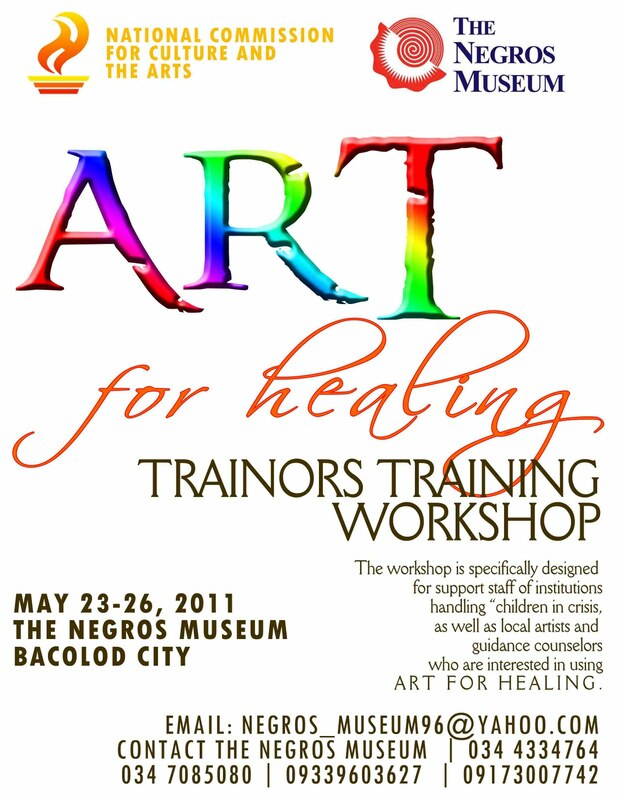 The Negros Museum and National Commission for Culture and the Arts thru the Artists for Crisis Program invites all NGOs working with children and interested participants to the Art for Healing Trainor’s Training Workshop which will be held on May 23 – 26 at the Negros Museum. The workshop is specifically designed for support staff of institutions handling “children in crisis, as well as local artists and guidance counselors/psychology teachers who are interested in using Art for Healing. The objectives of the workshop are as follows: to provide “children in crisis” a creative and artistic venue of expressing powerful emotions; to equip support staff of institutions handling children in crisis, basic skills to interpret and process art images and expressions; to help institutions handling children in crisis create an in house program using Art to help in the healing of traumatic experiences; and, to establish a (possible) network between institutions handling children in crisis, local artists and counselors/psychology instructors which can help sustain a program using Art for Healing. 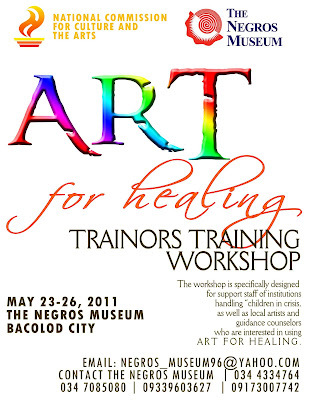 The Negros Museum envisions a collaborative effort between local Negrense Artists who will conduct the art workshops, with the NGO support staff interpreting and processing the art expressions in partnership with guidance counselor/psychologists so that they could develop activities which can help address the issues of their clientele which can help in the process of healing. “Children in Crisis” refers to children who have experienced emotional, physical and sexual abuses as well as children who have undergone traumatic experiences and the “Support Staff” of institutions handling “children in crisis” refer to social workers, house mothers/fathers, volunteers, educators. The Negros Museum encourages those who are interested to send two participants to the workshop. Workshop Fee is Php 1,500 per participant or Php 2,500 for two participants. For more information and reservation of slots for the workshop, please contact the Museum at 433 4764 or 708 5080 | 0921-3307861.